$540.00 Empress Maria Alexandrovna Merit Medal in Silver for Outstanding Achievements to a Graduate of a High School for Girls ("Zhenskaya Gimnasia"), 38 mm. A very scarce 1870-80 medal from the Alexander II reign. Comes with period attachment to wear as a badge or brooch. Fine to very fine overall condition. $480.00 Nicholas II Silver Prize Medal "For the Best Saddle Horse". 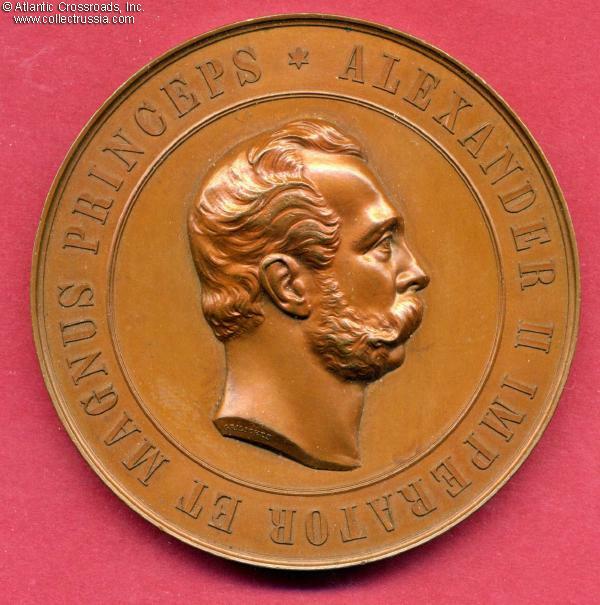 $220.00 Imperial Moscow Agricultural Society Award Medal - Table Medal in Bronze These award medals may have borne this handsome profile of Alexander I regardless of the actual reign in which they were awarded. $295.00 "On the Opening the of Alexander Column in St. Petersburg, 1834," bronze commemorative table medal. $450.00 Rare Bronze Table Medal Commemorating the Foundation [i.e. Groundbreaking] of St.Vladimir University in Kiev, 1835. $330.00 "For 20 Years as Director of the Ministry of State Property, Count P D Kiselev", 1856, bronze commemorative table medal. $340.00 "For 50 Years of Service, [General of Artillery] N.O. Sukhozanet, " 1861, bronze commemorative table medal. $120.00 People's Medal in Memory of Events That Coincided with the 1000th Anniversary of Russia, 1862. Brass version, 28.5 mm wide. Features bas-relief portrait of Alexander II and flag emblazoned with many key achievements of his reign such as the liberation of peasants and improvements in national education system. An attractive piece in excellent condition. $170.00 Russian Society for the Protection of Animals Table Medal in Bronze 1865; The Russian Society for the Protection of Animals was founded one year before the American Society for the Protection of Animals in the USA. $290.00 100th Anniversary of the Imperial Liberal Economic Society, bronze award medal, 1865. $220.00 Female Gymnasiums Prize Medal, in Bronze. Gymnasiums were private schools for the daughters of the nobility, so deportment - both social and academic - rather than athletic ability determined the awardees. $245.00 Opening of Monument to Alexander II in Helsingfors [Finland] 1894, Table Medal in Bronze. Handsome albeit slightly romanticized profile of the Tsar Liberator. $220.00 Opening of Monument to Catherine II in Saint Petersburg 1873 - Table Medal in Bronze. This medal was distributed at the unveiling of the large and beautiful statue on the Nevsky Prospekt that commemorates not only Catherine and but the famous men and women of her entire era. It was then (and still is) the only statue of her in the entire city of St. Petersburg. $395.00 "General Alexander Alexeevich Barantsov" , Table Medal in Bronze. Great detailed portrait of a general officer; one can identify most of the General's awards on the obverse and each of the models of artillery shown on the reverse! $175.00 "To F.I. Jordan, 50 Years as an Artist. 1874," bronze commemorative table medal. $275.00 Siberia-Ural Scientific and Industrial Exhibition in Ekaterinburg 1887 - Table Medal in Bronze An attractive and important example of a medal struck to commemorate a significant regional event. Ekaterinburg continues to be an important economic powerhouse in modern Russia. $240.00 200th Anniversary of the Founding of St. Petersburg, Table Medal in Bronze - 1903. Attractive medal commemorating the founding of "the Venice of the North". $195.00 100th Anniversary of the Ministry of War, Table Medal in Bronze. Several ministries came into existence during the reign of Alexander I and their anniversaries were celebrated during the first decade of the twentieth century. $240.00 100th Anniversary of the Forestry Institute in St Petersburg 1903 - Table Medal in Bronze. Several ministries came into existence during the reign of Alexander I and their anniversaries were celebrated during the first decade of the twentieth century. $180.00 Large Bronze Napoleonic Wars Battle of Leipzig 1813, Commemorative Table Medal.